When King Louis XIV issued a series of edicts requiring French nobility to melt their silver services to fund the nation’s war efforts (from 1689 to 1709), faience manufacturers were quick to provide elegant ceramic services to fill the void. France had not yet learned the secret to making porcelain and imported Asian porcelains were so expensive as to be limited to royal and aristocratic collectors. Other wealthy patrons chose faience, an accessible material that not only resembled porcelain, but also supported a national industry and patriotically demonstrated one’s commitment to the king’s military program. 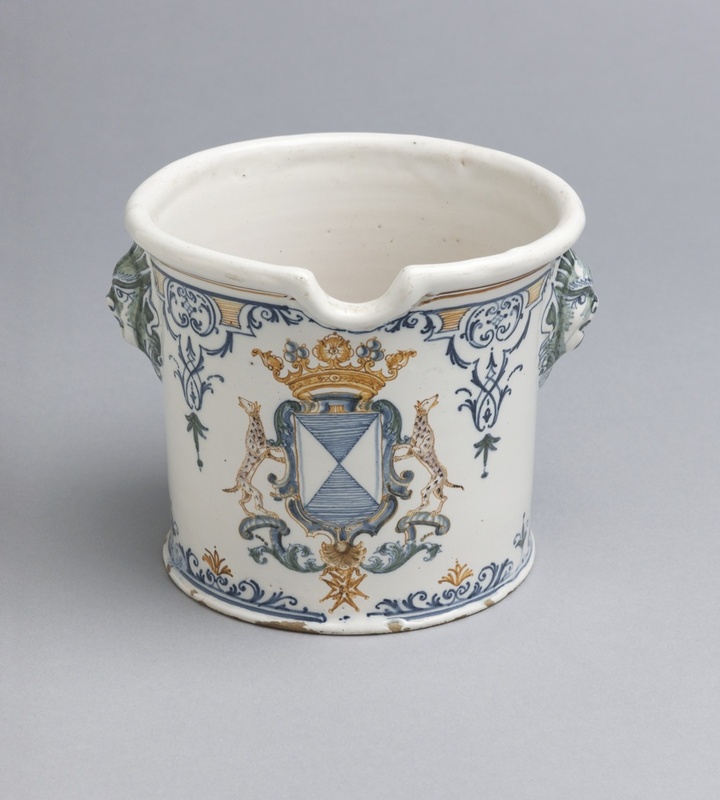 Entrepreneurial pottery owners pursued regional clientele, as evidenced by dining services with the arms of influential Provençal families. This wine glass cooler produced at the Olérys and Laugier factory of Moustiers was part of a larger service commissioned for Jean-Baptiste Victor de Rochechouart, Marquis de Blainville (1712 – 1771), who lived in southeastern France. The Rochechouart family is one of the oldest noble lines in the country, and its members were well connected at the royal court. The Marquis was the nephew, once removed, to Madame de Montespan, mistress to Louis XIV. The Olérys service shows his arms with the chivalric Order of Saint Louis. Even with his royal connections, the Marquis ate from faience. Tin-glazed earthenware is sometimes viewed as the provincial cousin of porcelain, but it is evident that in the early eighteenth century, when the European porcelain industry was in its infancy, the most elite and influential figures chose faience as a fashionable luxury through which to distinguish themselves. Do you have any photos or drawings of this item put to use? Wondering about the little dip – for the stem of the glass?